Bernardo Yorba adobe site, 1961, California State Historical Landmark #226 (courtesy the Orange County Archives). Since 1931, the State of California has recognized more than 1,000 buildings, sites, and events as historical landmarks. The distinctive, bear-topped plaques that mark these landmarks are a lure to historians, history buffs, and tourists alike. This started out as a simple list of all the California State Historical Landmarks in Orange County. But like too many projects, it quickly got out of hand. That’s because in compiling the list, I noticed there were all sorts of differences, both large and small, between the “official” text for these sites as listed on the website and in the publications of the State Office of Historic Preservation and the wording on the actual plaques. So I decided I needed to post both versions, along with some other material. That brings me to a rather delicate point . . . writing historical plaques is a tough job; there are serious space limitations that prevent you from saying much of anything, and “typos” are not easily corrected. So I’ve also taken it on myself to make a few additions and corrections to these plaques. Some of them were written more than 80 years ago, and we have definitely learned more about our local history since then. The California State Historical Landmark program was a long time in coming. Private organizations, such as the Sons of the Golden West and the Daughters of the American Revolution began placing plaques around the state in the 19th century. The California State Chamber of Commerce became active in the effort in the 1920s, and when the State Legislature established a system “to register and mark buildings of historical interest or landmarks” in 1931, the chamber took charge of the program, under the direction of the State Park Commission. Over the first decade of the program, more than 375 sites were approved. In 1949, the California Historical Landmarks Advisory Committee (now the State Historical Resources Commission) was formed to consider applications for historical sites. Originally the standards for determining just what constitutes a state historical landmark were a little loose, and some plaques were placed without any approval at all. Since the 1960s standards have been tightened up considerably. This trend can be seen in Orange County, where efforts to identify state historical landmarks began in 1929, when the State Chamber of Commerce simply asked local historian Terry Stephenson to draw up a list of ten potential sites, in consultation with the Orange County Historical Society and the Board of Supervisors. The committee managed to get several plaques erected in the 1950s as they found cities and organizations willing to put up the money, but some registered sites remain unmarked to this day. Over the years, a few additional applications have been submitted to the state, and more sites added to the local list, but they are few in number. In recent years, the trend in Orange County seems to be to seek listings on the National Register of Historic Places rather than with the state landmark program. But despite the National Register’s growing status, most sites here are only listed at the “local” level of significance. Other Orange County sites certainly deserve state-wide recognition, such as the old Santiago Orange Growers packing house in Orange, the site of the Hoover School in Westminster, which figured in the 1940s school desegregation case of Mendez v Westminster, the El Toro Marine Corps Air Station, the Santa Ana YMCA (birthplace of Toastmaster’s International), the discovery well at Huntington Beach, and maybe even Knott’s Berry Farm. In order to maintain the prestige of the existing state historical landmarks in Orange County, new sites need to continue to be added to this list. Official text: #112 NORTH GATE OF CITY OF ANAHEIM - A wall or fence of willow poles that took root and grew was planted around the Anaheim Colony to keep out the herds of wild cattle that roamed the surrounding country. Gates were erected at the north, east, south, and west ends of the two principal streets of the colony. The north gate, on the highway to Los Angeles, was the main entrance to the city. Location: In the sidewalk near 775 Anaheim Blvd., Anaheim, CA. Notes: Orange County’s first state historical landmark plaque looks very different from modern markers. Work on the monument actually began in 1932, when a granite boulder bought down from Mt. Baldy was set in the sidewalk in a “picturesque ceremony” during the city’s 75th anniversary celebration under the direction of the Mother Colony Chapter of the Daughters of the American Revolution. A “suitable bronze tablet telling of the historical site” was added soon after. One of the two directional markers pointing to the actual Dana Point site; this one in Capistrano Beach. Official text: #189 DANA POINT - Named for Richard Henry Dana, author of Two Years Before the Mast, who visited here in 1835. El Embarcadero, the cove below, was used by hide vessels trading with Mission San Juan Capistrano. This trade reached its peak in 1830-1840. In 1818 pirate Hipolito Bouchard, flying an Argentine flag, anchored his fleet here while raiding the mission. Named for Richard Henry Dana, author of “Two Years Before the Mast,” who was here in 1835. El Embarcadero, the cove below, was used by hide vessels trading with Mission San Juan Capistrano. This trade reached its peak in 1830-1840. In 1818 pirate Hipolito Bouchard, flying an Argentine flag, anchored his fleet here while raiding the mission. Location: Ken Sampson Overlook, Street of the Blue Lantern at Santa Clara Avenue, Dana Point, CA. Named for Richard Henry Dana. Described in his book “Two Years Before the Mast” as the most romantic California spot. In the glamorous days of the ranchos, 1830-1840, Yankee vessels traded supplies for hides here. 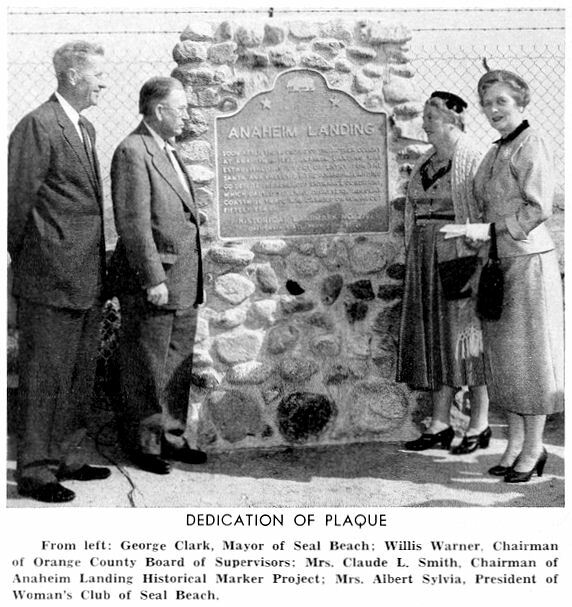 The main plaque was dedicated September 8, 1955 through the efforts of the Historical Marker Committee of the Associated Chambers of Commerce and the Dana Point Civic Association. While often branded a pirate, Bouchard actually sailed with a letter of marque from the United Provinces of Rio Plata (in modern Argentina), charged with disrupting Spanish shipping and settlements during their revolution against Spain, thus making him a privateer (the distinction was probably lost on the ships he attacked and towns he sacked). Official text: #198 OLD LANDING - On September 10, 1870, Captain Samuel S. Dunnells and William A. Abbott opened Newport Bay to commerce when they entered it for the first time on the sternwheel steamer Vaquero. The landing was designated 'Newport' - a new port - by James Irvine, Benjamin Flint, James McFadden, and Robert McFadden. The McFaddens operated a regular shipping service here during the 1870s and 1880s. On September 10, 1870, Captain Samuel S. Dunnells and William A. Abbott opened Newport Bay to commerce when they entered it for the first time on the sternwheel steamer Vaquero. The landing was designated “Newport” – a new port – by James Irvine, Benjamin Flint, James McFadden, and Robert McFadden. The McFaddens operated a regular shipping service here during the 1870s and 1880s. Originally registered June 20, 1935. Plaque placed by the State Department of Parks and Recreation in cooperation with the Newport Beach Historical Society and City of Newport Beach. April 16, 1986. Location: Previously located on Dover Drive, north of the Pacific Coast Highway, now located on the south side of Pacific Coast Highway at the foot of Dover Drive, near the entrance to the Bayshore Apartments, in Newport Beach, CA. Notes: The original stone monument and plaque, “placed at the west approach to Bay Bridge on Coast Highway,” was dedicated in August 1954 by the Historical Marker Committee of the Associated Chambers of Commerce. Arthur J. McFadden, the son of Robert McFadden, was one of the guest speakers. Years before, James McFadden had explained that the name “Newport” was originally suggested by Mrs. B.G. Perkins, wife of the manager of the Irvine Ranch, “and this suggestion was accepted by James Irvine, Sr., Benjamin Flint, my brother Robert, and myself.” The plaque later disappeared and a replacement plaque was erected in 1986. Official text: #199 THE SERRANO ADOBE - Cañada de los Alisos, also called El Toro, was granted to José Serrano in 1842 by Governor Alvarado. Senor Serrano and his relatives erected a number of adobes on the grant, one of which still serves as private living quarters. Location: On the front of the adobe, Heritage Hill County Historical Park, 25151 Serrano Road, Lake Forest, CA. Notes: An early plaque, probably placed by the Whiting family, which owned and restored the adobe in the 1930s. The site was actually registered in 1935. Official text: #200 MISSION SAN JUAN CAPISTRANO - Founded in 1776 by Padre Junípero Serra, this is the seventh in the chain of 21 missions established in Alta California to christianize and civilize the Indians. The stone church was destroyed in 1812 earthquake. Expropriated during Mexican rule, the mission was returned to the Catholic church in 1865 by proclamation of President Abraham Lincoln. Founded in 1776 by Padre Junipero Serra, The seventh in the chain of twenty-one missions established in Alta California to Christianize and civilize the Indians. Stone Church was destroyed in 1812 earthquake. Expropriated during Mexican rule. Returned to the Catholic Church in 1865 by proclamation of President Abraham Lincoln. Location: Long located near the mission entrance at the corner of Ortega Hwy and Camino Capistrano, the plaque was removed during the recent reconstruction of the entrance and is still awaiting a new location. Notes: Originally dedicated November 15, 1953 in a ceremony sponsored by Historical Markers Committee of the Associated Chambers of Commerce. Willis Warner, longtime Chairman of the Orange County Board of Supervisors presented the plaque to the mission on behalf of the residents of Orange County. Official text: #201 PIONEER HOUSE OF THE MOTHER COLONY - Anaheim's first house, built in 1857 by Founder George Hanson. 'The Mother Colony,' a German group that left San Francisco to form a grape-growing colony in Southern California, selected the name given to this settlement. The vineyards, which became the largest in California, were destroyed by disease in 1885. The colony then started producing Valencia oranges. Here once resided actress Helena Modjeska and Henryk Sienkiewicz, author of Quo Vadis. Marker placed by California Centennials Commission in cooperation with Grace Parlor #242, N.D.G.W. Mother Colony Parlor #281, N.S.G.W. Location: On the front of the Mother Colony House, 414 N. West Street, Anaheim, CA. Notes: The Mother Colony House had been preserved and restored as a historic site in 1929. The Mother Colony Parlor, Native Sons of the Golden West and the Grace Parlor, Native Daughters of the Golden West, sponsored the dedication ceremony in 1950, which included a variety of speakers. “The plaque will be placed on a stone front to a bench which has been erected between the Mother Colony house and the old Peter Stoffel house,” part of the memorial park (L.A. Times, July 8, 1950). George Hansen was actually the manager of the Los Angeles Vineyard Society, who selected and prepared the site for the arrival of colonists. The statement that “Here once resided” Modjeska and Sienkiewicz has misled some people; they did not live “here” in the Mother Colony House, but “here” in Anaheim – briefly – in 1876. Official text: #202 SILVERADO - Located in Cañada de la Madera (Timber Canyon) was a mining boomtown founded in 1878 when silver was discovered nearby. During the colorful life of its boom, 1878-1881, miners flocking to the area established a thriving community, served daily by stage from Los Angeles and Santa Ana. Located in Cañada de la Madera (Timber Canyon), was a mining boom town founded in 1878 when silver was discovered nearby. During the colorful life of the boom, 1878-1881, miners flocking to the area established a thriving community, served daily by stage from Los Angeles and Santa Ana. Location: Across from the Maple Springs Visitors Center, 31330 Silverado Canyon Road, Silverado, CA. Notes: Dedicated prior to 1957 by the Historical Marker Committee of the Associated Chambers of Commerce. Official text: #203 RED HILL - In early descriptions it was known as Cerrito de las Ranas, meaning the Hill of the Frogs. In the 1890s this hill became the scene of mining excitement. Its soil composition, very red in color, had caused early American settlers to name it Red Hill. The private Red Hill plaque, placed in 2005. Location: Red Hill Elementary School, 11911 Red Hill Road, North Tustin, CA. A promontory which served as a landmark for early travelers. It was called “Katuktu” by the Indians. The actual Red Hill is a little ways south, above La Colina west of Browning. Unmentioned on either plaque is the fact that the hill’s red color is an indication of cinnabar, and the mining done here off and on in both the 19th and 20th centuries was for mercury. Official text: #204 OLD SANTA ANA - Portolá camped on the bank of Santa Ana River in 1769, and José Antonio Yorba, a member of the expedition, later returned to Rancho Santiago de Santa Ana. El Camino Real crossed the river in this vicinity. The place was designated Santa Ana by travelers and known by that name until the present town of Santa Ana was founded. Portola camped on bank of Santa Ana River in 1769. José Antonio Yorba, member of the expedition, later returned to Rancho Santiago de Santa Ana. El Camino Real crossed river in this vicinity. Place was designated Santa Ana by travelers, and known by that name until present town of Santa Ana was founded. Location: Northwest corner of Lincoln Ave and Orange Olive Rd, Orange, CA. Notes: This monument was dedicated March 16, 1957 by the Historical Marker Committee of the Associated Chambers of Commerce. 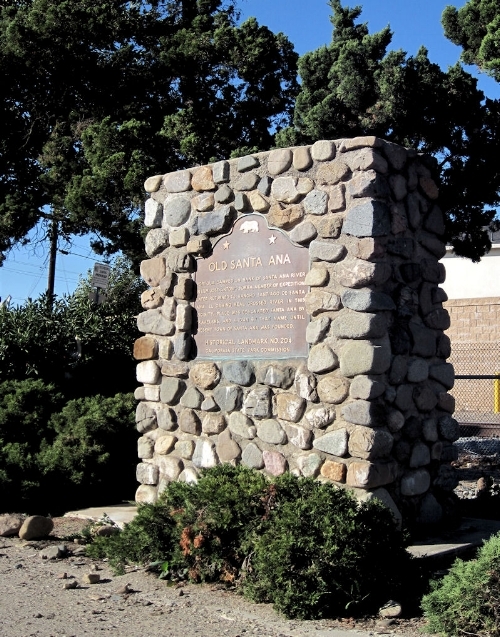 The stone base was built by members of the Olive Improvement Association, headed by Anselmo W. Ames, a Yorba descendant. Modern research has shown that José Antonio Yorba did not come with Portolá in 1769, but arrived in California two years later with the first Spanish re-enforcements. The Santa Ana River was named by the soldiers on the expedition in 1769. In 1957, Olive’s Santa Fe depot, volunteer fire department, and the Olive Heights packing house all stood nearby; today only the marker survives. Official text: #205 MODJESKA'S HOME - Famous as the home of Madame Modjeska, one of the world's greatest actresses, the house was designed by Stanford White in 1888 and built on property called the 'Forest of Arden.' Sold soon after her retirement, it remains a monument to the woman who contributed immeasurably to the cultural life of Orange County. Famous as the home of Madame Modjeska one of the world’s great actresses. It was designed by Stanford White in 1888 on property called the “Forest of Arden.” Sold soon after her retirement, it remains a monument to the woman who contributed immeasurably to the cultural life of Orange County. Location: Southwest corner of Modjeska Canyon Road and Olive Hill Rd., Modjeska Canyon, CA. Notes: Dedicated August 7, 1954 by the Historical Marker Committee of the Associated Chambers of Commerce. The ceremony included speeches by County Supervisors Willard Smith (who had worked with Terry Stephenson on developing the original plaque list in the 1930s) and Willis Warner. The Irvine Foundation paid for marker. Official text: #217 BLACK STAR CANYON INDIAN VILLAGE SITE - The Indians who lived on the village located here had stolen some horses, and the whites followed them back to their camp. After a skirmish, the whites left with the horses that the Indians had not killed. In 1878 the Black Star Coal Mining Company had a mine at the mouth of the canyon. Location: Black Star Canyon Rd, approximately six miles north of Silverado Canyon Rd. Official text: #218 BARTON MOUND - Juan Flores, who had escaped from San Quentin, was being sought by James Barton with a posse of five men. Near this mound, Flores surprised Barton and three of his men, all four were killed. When Los Angeles learned of the slaughter, posses were formed, and Flores and his men were captured. Location: Just southeast of the 405/133 interchange in Irvine, CA. Notes: No plaque has yet been placed. The small hills seem to have been lost to the freeways. The Laguna Altura Trail (accessible from the San Diego Creek Trail near the Los Olivos Apartments) will get you close to the site. Looking down from the Laguna Altura trail to the approximate site of Barton Mound. Official text: #219 ANAHEIM LANDING - Soon after the founding of the Mother Colony at Anaheim in 1857, the Anaheim Landing Company established Anaheim Landing as a port for the Santa Ana Valley. Despite treacherous entrance conditions that caused several disasters, regular coastwise trade was carried on here for about 15 years. Soon after the founding of the Mother Colony at Anaheim in 1857, Anaheim Landing was established as a port of entry for the Santa Ana Valley by the Anaheim Landing Co. Despite treacherous entrance conditions, which caused several disasters, regular coastwise trade was carried on for about 15 years. Location: Seal Beach Blvd., just east of Electric Ave., Seal Beach, CA. Notes: Dedicated March 18, 1956 by the Historical Marker Committee of the Associated Chambers of Commerce, with the support of the Seal Beach Woman’s Club. Boy Scouts and other organizations helped gather the stones to build the monument and the county put up the $150 for the plaque. It took three weeks to build the stone base, with the builders carefully selecting “beautiful and rare” stones for front of the monument. “Soon” after the founding of Anaheim was 1864, when the port was originally established at the mouth of the San Gabriel River. It was moved here after the floods of 1867. Official text: #225 FLORES PEAK - In 1857, Juan Flores and a band of outlaws murdered Sheriff James Barton and part of his posse at Barton Mound. Pursued by a posse led by General Andrés Pico, Flores and his men were finally caught on Flores Peak. Location: Opposite the Modjeska home on the north side of Modjeska Canyon Road, Modjeska Canyon, CA. Notes: No plaque has yet been placed here. While several of the bandits were captured here on the peak, Flores himself got away, only to be captured later, escape, and be captured again before finally being hanged in Los Angeles. Official text: #226 DON BERNARDO YORBA RANCHHOUSE SITE - Here Don Bernardo Yorba created the greatest rancho of California's Golden Age, combining the Santa Ana Grant awarded to his father by the King of Spain in 1810 and lands granted to him by Governor José Figueroa in 1834. He was the third son of José Antonio Yorba, who came with Don Gaspar de Portolá in 1769 to establish California's first family. On this land, portion of Santa Ana grant awarded by King of Spain 1810 to José Antonio Yorba, and additional grants to his son by Governor José Figueroa 1834, was created hacienda of Don Bernardo Yorba. Greatest ranchero of golden age, Bernardo Yorba was third son of José Yorba, who came to California with Don Gaspar de Portolá 1769, and established California’s first family. Marker placed by California Centennials Commission. Base furnished by Placentia Round Table Club. Location: Northeast corner of Esperanza Road and Echo Hill Lane, Yorba Linda, CA. View the 1950 plaque dedication program here. The original monument and plaque was moved a short ways east and north to its current location around 1974, when Esperanza Road was widened. The bits of tile the ladies collected are still visible on the back side of the monument. The adobe site is now under the asphalt. Official text: #227 DIEGO SEPÚLVEDA ADOBE - This adobe house was built as a station of Mission San Juan Capistrano. After secularization the property became part of Rancho Santiago de Santa Ana, and the adobe was used as headquarters of Diego Sepúlveda, later owner of the rancho. This home of early Spanish Californians, erected in the 1820’s, once served as an “estancia” or station for Mission herdsmen. It was dedicated in 1963 for public use by the Segerstrom family and restored by the City of Costa Mesa. It is jointly maintained and operated by the Costa Mesa Parks Department and the Costa Mesa Historical Society. Plaque placed by the City of Costa Mesa on July 20, 1969, in observance of the 200th anniversary of permanent settlement in California. Location: At the entrance sign for Estancia Park, on the northwest corner of Mesa Verde Drive and Adams Avenue, Costa Mesa, CA. Notes: This adobe was originally built as an outpost of Mission San Juan Capistrano. Diego Sepulveda only owned a portion of the vast Rancho Santiago de Santa Ana. 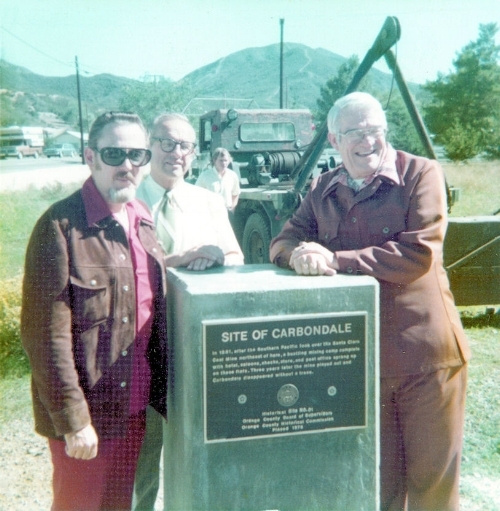 Dedication of the county historical marker for Carbondale, 1976, showing (L to R) historian Jim Sleeper, county historical commission member Lecil Slaback, and County Supervisor Tom Riley (courtesy the Orange County Archives). Official text: #228 CARBONDALE - This is the site of the 1878 coal discovery. The mine, called the Santa Clara, was operated by the Southern Pacific. The village of Carbondale was built on the flat. When the mine was closed down, Carbondale's buildings were moved away and today not one remains. Location: Calvary Chapel of the Canyons parking lot, 8002 Silverado Canyon Rd., Silverado, CA. Official text: #729 OLD MAIZELAND SCHOOL (RIVERA SCHOOL) - Constructed in 1868, this was the first school in the Rivera District. It was previously located on Shugg Lane, now Slauson Avenue. This was the first school in the Rivera District, constructed in 1868, and previously located on Shugg Lane, now Slauson Avenue. The Maizeland School, much remodeled, at Knott's Berry Farm, 2009. Location: Now the Pony Express Outpost at Knott’s Berry Farm, 8039 Beach Blvd, Buena Park, CA. Notes: The Maizeland School was originally located on the south side of Slauson Avenue, about 400 feet west of Rosemead Blvd., in the Pico-Rivera area. While the school district seems to have been formed in 1868, “Historians have not pinned down an exact date for the construction of the redwood building.” (L.A. Times, Dec. 21, 1972). The building was moved several times over the years and used for a variety of purposes. In 1953 it was given to El Rancho Unified School District to serve as a museum, but in 1957 it was moved to Knott’s Berry Farm. It was registered as a state historical landmark in 1960 – the first new listing in Orange County in 25 years. Official text: #775 SITE OF FIRST WATER-TO-WATER FLIGHT - On May 10, 1912, Glenn L. Martin flew his own plane, built in Santa Ana, from the waters of the Pacific Ocean at Balboa to Catalina Island. This was the first water-to-water flight, and the longest and fastest overwater flight, to that date. On his return to the mainland, Martin carried the day's mail from Catalina-another first. Glen [sic] L. Martin flew his own plane, built in Santa Ana, from the waters of the Pacific Ocean at Balboa to Catalina Island, May 10, 1912. This was the first water-to-water flight and the longest and fastest overwater flight to that date. Martin, on his return to the mainland, carried the day’s mail from Catalina – another first. Plaque placed by the California State Park Commission in cooperation with the City of Newport Beach, May 10, 1963. Location: This plaque was originally located in the park near the foot of the Balboa Pier but is currently missing. On May 10, 1912, Glenn L. Martin flew his hydroplane, built in Orange County, from the sea near the Balboa pier to Catalina Island. This was the fastest and longest flight over water at that time. This modern plaque (presumably placed by the city) has replaced the original 1963 state marker. Official text: #794 McFADDEN WHARF - The original wharf on this site was completed in the summer of 1888 by the McFadden brothers. As the seaward terminus of their Santa Ana and Newport Railway it became the funnel through which flowed a major part of the lumber and other goods that built Orange, San Bernardino, and Riverside Counties during the period from 1891 to 1907. The original wharf at this site was completed in the winter of 1888-89 and was connected by railroad with the hinterland in the winter of 1890-91. It served as a shipping and distributing point for Orange, San Bernardino, and Riverside counties until 1907, and provided the nucleus from which developed the City of Newport Beach. Location: At the foot of the Newport Pier, Newport Beach, CA. Notes: Here is a case where the plaque wording is a definite improvement over the “official” text. This site was registered in 1964. View the 1965 plaque dedication program here. (Top) Jim Sleeper and Mrs. Weston Walker, shown on dedication day at the Old Courthouse; Mrs. Walker played an important role in having the site listed as a historical landmark. (Bottom) A commemorative postal cover issued on dedication day. Official text: #837 ORANGE COUNTY'S ORIGINAL COURTHOUSE - Built in 1900 of Arizona red sandstone, this is the oldest existing county courthouse in Southern California. Significant and far-reaching court decisions were handed down here, including the 'Whipstock' case dealing with slant oil drilling, interpretation of farm labor law, and the Overell trial which resulted in law regulating explosives. Built in 1900 of Arizona red sandstone, this is the oldest existing county courthouse in Southern California. Significant and far-reaching court decisions were handed down here, including the “whipstock” case which dealt with slant oil drilling, interpretation of farm labor law, and the Overell trial resulting in law regulating explosives. Location: 211 W Santa Ana Blvd., Santa Ana, CA. Notes: Hard to believe today, but the Old Orange County Courthouse was once actually threatened with demolition. Mrs. Weston Walker, the founder of L.I.S.A., led the battle to protect the old landmark, and in 1969 convinced the Board of Supervisors to apply for historical status. The master of ceremonies for the plaque dedication in 1970 was William H. Spurgeon III, the grandson of the founder of Santa Ana. His father, William H. Spurgeon, Jr., was also in attendance. Completed in 1901, the Old Courthouse is not built “of” red sandstone, but is a steel and brick building with a Temecula granite foundation and a sandstone facade. Official text: #918 OLINDA – From 1897, when oil pioneer Edward L. Doheny brought in the first well, to the 1940s, the boom town of Olinda sprawled over the surrounding hills. To the north was the Chanslor-Candfield Midway Oil Lease and, to the south, the Olinda Crude Oil Lease. Walter Perry Johnson, of Baseball’s Hall of Fame, spent his boyhood here. The course of oil production was changed in 1899 when the Olinda area became the first site in California to use the technique of drilling with the hole full of water. Having been developed as a source of fuel oil for the Santa Fe Railroad, Olinda became a bustling boomtown at the turn of the century. Its demise came with construction of Carbon Canyon Dam in 1959. Location: Near the lake in Carbon Canyon Regional Park, 4442 Carbon Canyon Rd., Brea, CA. Notes: This site was registered in January 1978. 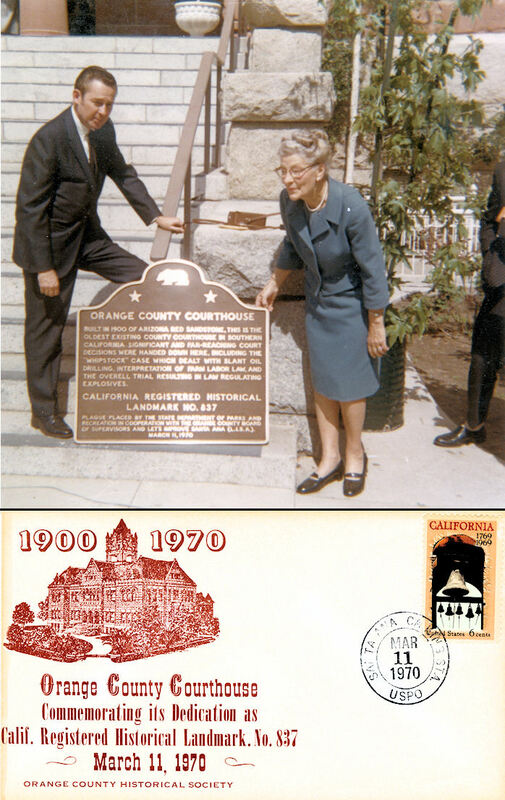 Despite the date on its face, this plaque was actually unveiled in February 1979 at a ceremony sponsored by the Board of Supervisors and conducted by the Orange County Historical Commission. Historian Esther Craemer spoke that day, and longtime commissioner Don Dobmeier served as master of ceremonies. Official text: #959 BALBOA PAVILION - This is one of California's last surviving examples of the great waterfront recreational pavilions from the turn of the century. Built in 1905 by the Newport Bay Investment Company, it played a prominent role in the development of Newport Beach as a seaside recreation area. In 1906, it became the southern terminus for the Pacific Electric Railway connecting the beach with downtown Los Angeles. The railway's Red Cars connected the beach with Los Angeles in only one hour. This is one of California’s last surviving examples of the great waterfront recreational pavilions from the turn of the century. Built in 1905 by the Newport Bay Investment Company, it played a prominent role in the development of Newport Beach as a seaside recreation area. In 1906, it became the southern terminus for the Pacific Electric Railway, connecting the beach with downtown Los Angeles. The railway’s Red Cars connected the beach with Los Angeles in only one hour. Location: In the office window of the Balboa Pavilion, 400 Main Street, Balboa, CA. Notes: An earlier plaque was presented to the owners of the pavilion by the Newport Beach Historical Society in 1968. The papers at the time report that the building had already been approved as a state historical landmark but it in fact was not registered until December 1983. Official text: #1004 OLD TOWN IRVINE - Old Town Irvine stands today as a testament to the rich agricultural past of what has become one of California's most heavily urban counties. Founded in 1887 as the distribution and storage center of the 125,000-acre Irvine ranch, Old Town Irvine was to develop over the years a bean and grain storage warehouse (1895) and granary (1947) known as the Irvine Bean and Grain Grower's Building, a blacksmith's shop (1916), a hotel (1913), a general store (1911), and an employees' bungalow (1915). All of these structures have been rehabilitated for commercial uses and their exteriors have been painstakingly maintained. Location: Southeast corner of Sand Canyon Avenue and Burt Rd, Irvine, CA. The townsite began in 1887 with the arrival of the AT&SF RR. James Irvine II chose this site to be the shipping center for crops grown on the Irvine Ranch, due to its high elevation. Original buildings remaining include the Bean Shed (1895), Bulk Storage Warehouse (1949), Blacksmith Shop (1912), Garage (1929), Tenant Farmhouse (1897), General Store (1912), and Hotel (1913). The Hotel and Store were moved from across Sand Canyon Avenue in 1986. Dedicated by Santa Ana Parlor N. 235. Official text: #1015 RICHARD NIXON BIRTHPLACE - In 1912 Frank and Hannah Nixon built this modest farmhouse on their small citrus ranch. Here Richard Nixon was born, January 9, 1913, and spent his first nine years. He served his country as Congressman, U.S. Senator, Vice President, and 37th President of the United States (1969-1974). He was the first native-born Californian to hold the Presidency. President Nixon achieved significant advances in International Diplomacy by ending U.S. involvement in the Vietnam War, opening lines of communication with China and the Soviet Union, and initiating the Middle East Peace process. In 1912 Frank and Hannah Nixon built this modest farmhouse on their small citrus ranch. Here Richard Nixon was born, January 9, 193, and spent his first nine years. He served his country as Congressman, U.S. Senator, Vice President, and 37th President of the United States (1969-1974). He was the first native-born Californian to hold the presidency. President Nixon achieved significant advances in international diplomacy by ending U.S. involvement in the Vietnam War, opening lines of communication with China and the Soviet Union, and initiating the Middle East peace process. Plaque placed by the State Department of Parks and Recreation in cooperation with the Richard Nixon Library & Birthplace. Location: Outside the home at the Richard Nixon Library & Museum, 18061 Yorba Linda Blvd, Yorba Linda, CA. Notes: Dedicated on what would have been Nixon’s 82nd birthday. His youngest brother, Edward, took part in the ceremony. Official text: 1050 CRYSTAL COVE HISTORIC DISTRICT - Many of California’s coastal cities began as recreational communities. Post World War II development changed the nature of most of those communities, especially in southern California. Crystal Cove is a southern California coastal community significant for having retained its vernacular character as well as architectural and construction style dating back to the 1930s. It is the last historical property of its type in the region. The district forms a self-contained neighborhood of 12.3 acres located within Crystal Cove State Park. Dedicated 2014, the 150th anniversary of California State Parks. Location: At the shuttle bus stop from the Los Trancos Parking Lot, near the historic cottages at Crystal Cove State Park, 8471 North Coast Highway, Laguna Beach, CA. Notes: This plaque moved around through various locations around the park until it was finally mounted on September 18, 2017. Park Superintendent Eric Dymmel and State Senator John Moorlach (whose hobbies include visiting and photographing state historical landmark plaques) did the unveiling.